I have been posting updates for One Eyed Jake (OEJ) during this years EC2013. This years challenge is the second event for OEJ. Sometime during last years EC2012 OEJ met DolphinGal, and together they battled the elements. Time and weather conditions were not on their side - and they both decided to stop before reaching check point 3. This year OEJ and DolphinGal had been in contact talking about their plans and statergies. The event began last Saturday and everyone was off on their own. As I was tracking OEJ, every once and a while I would look to see how other competitors. When I saw that DolphinGal was a considerable distance behind OEJ I began to feel sorry for her. But I was wrong. DolphinGal didnt need anyone feeling sorry for her. She was determined. She was not going to fail to finish this years challange. I tracked DolphinGal as she began to enter the everglades. She was alone, and nightfall was around her. There she was determined to not let the simple fact that the sun had set. She was going to paddle on. She paddled on and on and on. All alone, no one to talk with the discuss which way should we go now - left or right. She did it all - alone on with her inner spirit pushing her to continue. This morning DolphinGal made it to Flamingo, and is now enroute to Key Largo. What an amazing competitor!! I know that she will complete this EC2013. Something that she will forever remember. Way to go DolphinGal. You're right on about DolphinGal Len. She's got what it takes mentaly and emotionally to press on and finish! I've seen this in her before in the MR340 and the NCC. Congratulations to Dolphin Gal! Way to represent, great record. My wife and I came up behind her on the way to Picnic Island just before Sanibel, and the conditions were best described as "washing machine". Our big tandem is 100 pounds and 23 feet long, and we were having trouble keeping it straight, and she was getting tossed all over the place. We asked her if she wanted us to stay with her, and she replied "No, but come back and get me if I don't show up shortly". We pulled around to the lee side of the Island and pulled up with four or five other tribers, and five minutes later there she was and as happy as a clam.. The next morning we all started off together, but soon got separated. We were in front of her, but dropped out at the Marco Island bridge, knowing that we couldn't make the CP-2 cut off unless we paddled through the night, and we just didn't have the stamina to do it. She must have paddled through the night and made it. Go DolphinGirl go! We are rooting for you ! I was watching you two and was wondering what happen to you. I could see where you were but nothing was ever mentioned as to your status. I was glad to see you and hope you'll give it another try. Will I see you tomorrow? We'll be there tomorrow. No, wanna buy a boat?? It's up for sale. Len - I'm glad to see someone posting about DolphinGal's efforts. 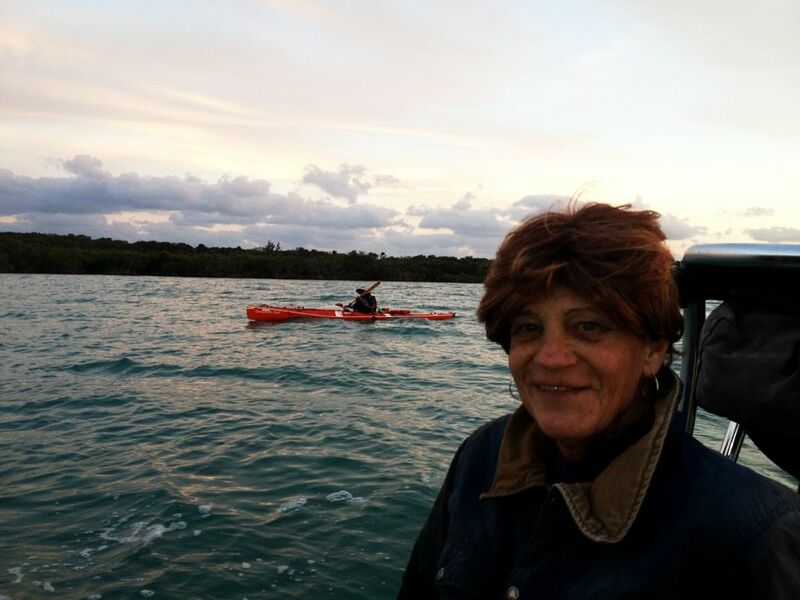 I've never met her but she is a kayaking/campiing friend of my friend Vivian. It did seem from her SPOT tracks that she was struggling but I never really was sure. She kept on keeping on. When she entered the Wilderness Waterway I kept imagnining being there alone at night in a race. 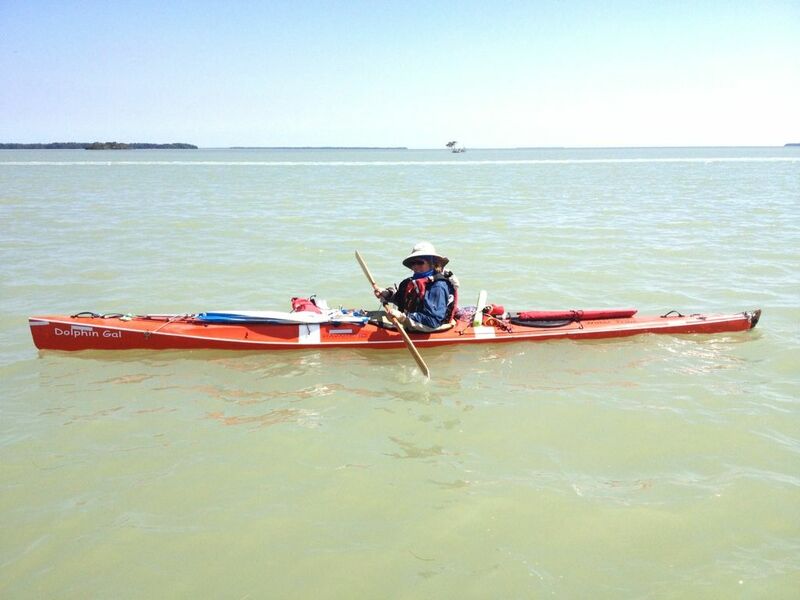 Kudos to her for her paddling skills and determination! I do hope she gets to the finish in time. DolphinGal finished, Once again an inspiring story much like the EC2011 finish. Amazing lady indeed. Congrats DG! 5 miles from the finish. Shore contact wanted to check her progress. Way to tough it out Dolphin Gal! I was watching last night till your finish. Congrats to Yukon John also! Such an incredible EC. All the challengers have much to be proud of. I'm looking forward to your personal stories and videos. Welcome to Key largo DG! It was good to see you finish!! Thank you Deena for the help you gave me after the finish line. I am happy to see Kathy in Key Largo. She trained hard for this EC and the alligator tooth. Thank you so very much MicroTom for taking me for a boat ride as the sun was setting Saturday. I admit I had a serious concern that Dolphingal was exhausted and possibly a bit loopy. If she had been sort of "disoriented" I would have encouraged her to land somewhere and camp. Instead she appeared bright, confident and in control. So she persevered and finally landed just after 2 a.m. which meant the loss of an additional hour in her results because of the time change since it was then just after 3 a.m. A short time later Dolphingal was sound asleep on a nice soft and warm motel bed. We collected her gear Sunday about 1 p.m. grabbed a nice lunch and set off for home. Somewhere North of Largo she dozed off and woke up about 3 and a half hours later when we pulled into her driveway. I twisted her arm to imbibe a glass of Cabernet and she went back into dreamland after finishing it. She has promised to post a few of her trip experiences just as soon as her hands uncurl from what looks strangely like she is still griping a paddle. Dolphin Gal, you are amazing! I passed you at least 3 times that I know of, only to have you slide by at night while I slept. You are one determined athlete, that is for sure. I am proud to know you, Kathy.